Color typing paper, color gesso, chalk pastel. Arm position was wrong and I lost the hand. But others in class are imitating the diamond shape and the jagged tape lines. Color gesso on Jill's rag; chalk pastel, and possibly other stuff. The arm position was wrong and then I lost the hand. Where did you hear that before?? But an interesting background covers for me. Ronette is wondering how many will gesso fabric for next week. I was called something this morning by an art student; "renegade", was it? Suddenly I remembered I was a renegade in the convent school, from age 7 onwards. So where did I loose it? P2P. The exciting part is I'm getting links to everybody's final posts. And they are very exciting. As to my own, I had to cut off the warp this afternoon. The warp was indeed much too short, and I rejigged the warp once too many and the tension became too uneven to weave. I have 110cm woven, and a good length of potential fringe on one end, too, too long for my taste on the other. It could still turn out to be a gorgeous shawl for someone about 2 ft tall. Or a cat. Disappointed, because it would have been a gorgeous silky scarf, but man, I learned a lot. 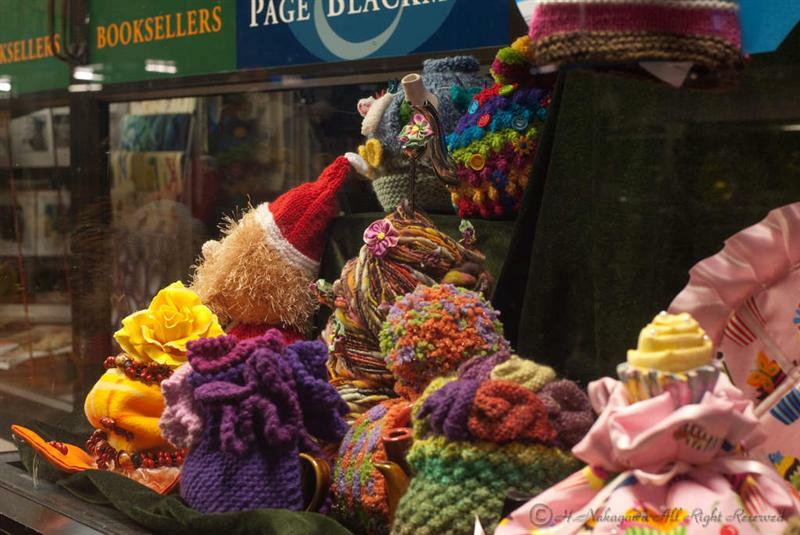 My wild tea cosy is kind of buried in a field of colors in the bookshop window. Disappointed, but hey, that's the way it works, isn't it? I'm too busy to worry about it. Onwards and upwards. Tomorrow is the writing workshop. In fact, it's quite amazing what I can hide with "nice" colors; in the top drawing both arms were in the wrong place and in the wrong proportion, and I fudged my way around the body and now I can't tell where the right breast really was, or in what shape. Oh bummer on the warp Meg, it happens to us all and not just once in a while. I do like the idea of shawl for a cat though....;) Not that's renegade! Happy to find your blog thanks to Life Looms Large. Renegade art is a good phrase. Theresa, All I can say is... "Why me, why now? Wa....... "
Thank you, Janet. Just so you know, this is not a very sane nor balanced platform. The blogger, moi, goes off the rail. Hey, I found a new name for myself just now: Dame Rantsalot! What? What happened to your hands???? ?